*Millwood Landing Golf and RV Resort* is located near I-30 north of Texarkana in a wooded, rolling area of southwest Arkansas! Visitors to Millwood Landing will enjoy the dynamic fishing on 28,000-acre Millwood Lake, one of the largest lakes in the state. The resort is an outdoor enthusiasts dream with golf, clubhouse and dining facilities available for your enjoyment. 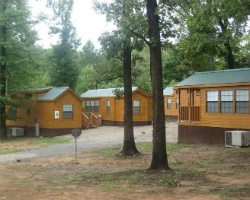 Resort lodging consists of cabins, a campground, and an RV park. Every year, an owner receives a complimentary stay in one of the cabins as well as unlimited use of the campgrounds and RV park. Owners have access to Coast to Coast Resorts across the United States! To discover more, visit www.coastresorts.com. Outstanding campground membership! Don't miss out, make an offer today!